Pik India Castors is the India's most leading & professionally managed company. We are the largest manufacturer and exporter of heavy duty Wheels Castors & Castor Wheels under our strict quality control. Our products are as per International standards We have our own four state-of-the-art Plants, all located in the heart of Gurgaon city, the central hub of business, in this field. 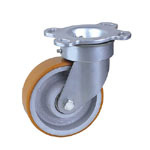 We offer wide range of heavy duty castor wheel. These wheels are available in various sizes and are very sturdy and their load carrying capacity. These can also be customized as per the specific requirement of our clients. 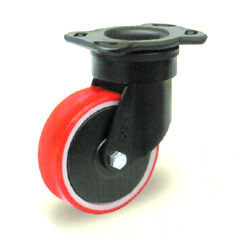 Fix Forged Caster pu with cast iron wheel. PIK INDIA Caster & Wheels offers a wide range of casters including: Light Duty Casters, Medium Duty Casters, Heavy Duty Casters, Extra Heavy Duty Casters, Super Heavy Duty Casters, Pneumatic Casters, Nylon, Fiberglass Casters, Dual Wheel Casters, Total Lock Casters, Kingpinless Casters, Stainless Steel Casters, Shopping Cart Casters.